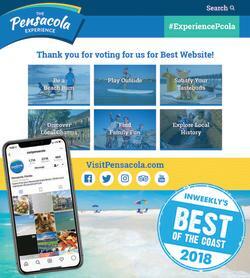 Pensacola, Fla.(Oct. 4, 2018) – Visit Pensacola is pleased to announce that it has been awarded Inweekly’s Best of the Coast Best Website and Runner-Up for Best Person to Follow on Instagram. InWeekly’s Best of the Coast began in September of 2000 and is one of the largest reader survey-based awards in Northwest Florida. Earlier this year, Visit Pensacola launched a new creative brand, The Pensacola Experience. Research clearly stated that the Pensacola Bay Area can be many different things depending on who you talk with. Six broad experiences were identified to help capture the local experience and to create the connection potential visitors seek. Those experiences were captured and available for exploration on the Visit Pensacola website and social channels. Last year, over 1.5 million visitors explored visitpensacola.com. The website has become the center-point of the community for events, things to do, live web cameras and more for locals and visitors alike. Similarly, the Visit Pensacola Instagram page received over 7.8 million impressions over the past year. The Visit Pensacola Instagram relies heavily on user-generated content to showcase authentic Pensacola experiences. This gives the brand an incredible opportunity to connect and interact with followers. Additionally, with the launch of Instagram Stories over the past year, it’s given Visit Pensacola the opportunity to showcase Pensacola experiences in real-time for residents and visitors. To learn more about Visit Pensacola, visit visitpensacola.com/experience/. To follow us on Instagram, visit instagram.com/visitpensacola/.